WASHINGTON -- The US will provide a humanitarian aid package worth nearly $32 million to Rohingya who have fled violence in Myanmar's Rakhine State in recent weeks, the State Department announced Wednesday during the United Nations General Assembly in New York. 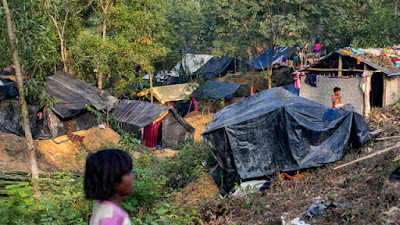 The funding "reflects the US commitment to help address the unprecedented magnitude of suffering and urgent humanitarian needs of the Rohingya people," said the State Department's Acting Assistant Secretary Simon Henshaw, noting that over 400,000 Rohingya Muslims have fled Myanmar, a majority Buddhist nation, for neighboring Bangladesh. He added that the US hoped its contribution would encourage other countries to provide more funding as well. The aid package comes a day after Secretary of State Rex Tillerson spoke with Aung San Suu Kyi, the de facto leader of Myanmar, also known as Burma, and "welcomed the Burmese government's commitment to end the violence in Rakhine State and to allow those displaced by the violence to return home," according to the State Department. Tillerson "urged the Burmese government and military to facilitate humanitarian aid for displaced people in the affected areas, and to address deeply troubling allegations of human rights abuses and violations." The State Department said the aid "will help provide emergency shelter, food security, nutritional assistance, health assistance, psychosocial support, water, sanitation and hygiene, livelihoods, social inclusion, non-food items, disaster and crisis risk reduction, restoring family links, and protection to over 400,000 displaced persons." Henshaw said Wednesday's announcement brought the total of US aid to Burmese refugees, including Rohingya, to nearly $95 million in fiscal year 2017. Hundreds of thousands of Rohingya, many of them women and children, have fled to Bangladesh to escape violence since August 25, according to the United Nations -- an average of almost 20,000 a day. The refugees speak of indiscriminate clearance operations, huts set on fire and family members being taken away and never heard from again. Speaking at the United Nations Security Council on Wednesday, Vice President Mike Pence called on the UN "to take strong and swift action to bring this crisis" of violence against the Rohingya people in Myanmar, formerly known as Burma, to an end. "The United States renews our call on Burma's security forces to end their violence immediately and support diplomatic efforts for a long-term solution," he said. "President Trump and I also call on this security council and the United Nations to take strong and swift action to bring this crisis to an end." Pence also spoke about how the violence in Myanmar is a perfect example of the kind of problem the United Nations should help solve. "Keeping the peace requires more than peacekeeping -- it requires action, reform and, lastly, it also requires a willingness to call out senseless attacks on innocent people around the world. At this very moment in Southeast Asia, we see heartbreak and assaults on human rights and innocent civilians that is ultimately endangering the sovereignty and security of the entire region," Pence said. To date, the international response has been inadequate, said Reza Afshar, policy director of Independent Diplomat, a non-profit group that offers diplomatic advice and is working with a Rohingya group. That's partly a function of the pace of the crisis, which has "moved incredibly quickly," Afshan said, but it's also a matter of political dynamics in the UN's Security Council, "where the assumption is that China isn't going to allow anything substantive in the Council" to punish Myanmar. Permanent members of the 15-member Council can veto a resolution. A well-articulated and carefully calibrated UN resolution on the Rohingya crisis would "get the government of Myanmar to sit up and take notice," Afshan said, adding that other countries had to "test China" by putting forward some language for a resolution. "That testing needs to happen, and happen soon," he said. The Organization of Islamic Cooperation, the second largest inter-governmental group at the UN with 57 members, met Tuesday and called for UN member states to consider cutting or curbing economic ties with Myanmar or suspending preferential trade agreements with the country. OIC members urged the Security Council to act immediately and their leaders spoke out against Myanmar in their General Assembly address. The Muslim community in the Rakhine region of Myanmar is being subjected to almost an ethnic cleansing, with provocative terrorist acts used as a pretext," Turkey's Recep Tayyip Erdogan thundered. Egyptian President Abdel Fattah al-Sisi urged the UN to "promptly work towards a lasting solution that ends the plight of civilians and addresses the root causes of the crisis, which has become a threat to regional security and the stability of neighboring countries." UN Secretary General Antonio Guterres opened the 72nd General Assembly by calling on authorities in Myanmar to "end the military operations allow unhindered humanitarian access and recognize the right of refugees to return in safety and dignity." Guterres recently suggested that the Rohingya are the victims of ethnic cleansing. "When one-third of the Rohingya population has got to flee the country, can you find a better word to describe it," Guterres said September 13. Pence, speaking at the UN, called out the Burmese military for the violence. "In recent weeks, the people of my country and the wider world have witnessed a great tragedy unfolding in Burma with the Rohingya people," he said. "Recently, Burmese security forces responded to militant attacks on government outposts with terrible savagery, burning villages, driving the Rohingya from their homes; the images of the violence and its victims have shocked the American people and decent people all over the world." "And now we are witnessing a historic exodus, over 400,000 Rohingya, including tens of thousands of children, have now been forced to flee from Burma to Bangladesh," Pence added. The announcement of a US aid package comes just one day after Myanmar's de facto leader Aung San Suu Kyi finally broke her silence on the Rohingya refugee crisis in a speech that drew widespread criticism. Suu Kyi did not denounce alleged atrocities against the Rohingya community and claimed the government needed more time to investigate the exodus from Myanmar of the minority Muslim group. Much of the speech appeared intended to frame the crisis as a complex internal issue and contrasted the violence -- which she depicted as isolated -- with the government's ongoing development agenda, specifically its efforts to deliver "peace, stability, harmony and progress" to the nation as a whole. Henshaw said that he wouldn't characterize her remarks, but added that, "we are urging the Burmese Government to control the violence in the area, to cease attacks against civilians, and to create safe conditions so that the Rohingya that have fled feel safe to return." The US welcomes Suu Kyi's announcement that the government would be "welcoming those who fled Rakhine state back to their homes," Henshaw said. "We encourage the government to act quickly on this commitment while ensuring the safety and wellbeing of returnees." When asked about Suu Kyi's comment that returning refugees have nothing to fear, Henshaw said that conditions aren't yet right for the refugees to return. The Rohingya are considered to be among the world's most persecuted people. The predominantly Buddhist Myanmar considers them Bangladeshi, but Bangladesh says they're Burmese. The government of Myanmar has blamed terrorists for starting the recent violence that has killed more than 1,000 people, according to recent a recent estimate from Yanghee Lee, the United Nations Special Rapporteur on Human Rights for Myanmar. Almost 40% of all Rohingya villages in Myanmar's Rakhine State are now empty, a government spokesperson confirmed earlier this week.